Sales expert Brian Brim delivers a compelling new perspective on building better sales forces by using the strengths of each salesperson more effectively. Includes access to Gallup’s StrengthsFinder assessment. The key to success, salespeople are constantly told, is to follow specific steps and techniques. Just heed the advice of this guru or that speaker, and you’ll be the best! Well, that approach just doesn’t work for most salespeople. And it probably doesn’t work for you either. 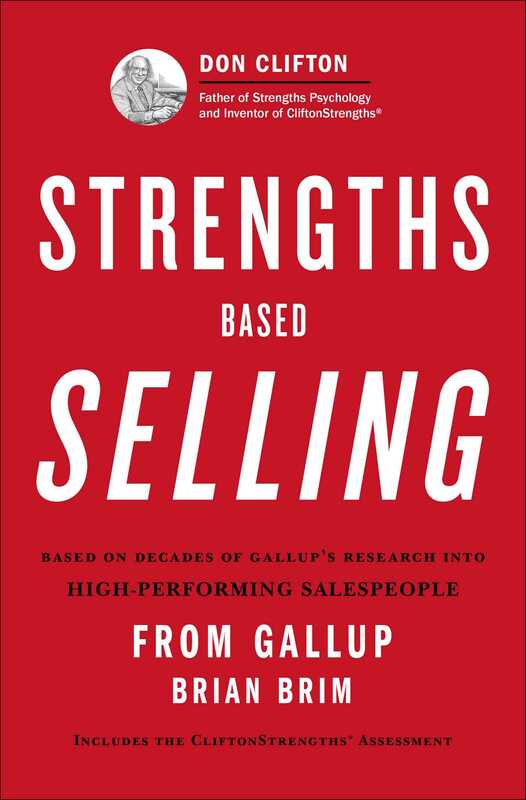 The most successful reps, Gallup has determined from decades of research, understand their innate talents and strengths and use them to sell more effectively. The truth is, no two great sales reps are alike: You might thrive on fierce competition, while a colleague wins by being a super-analytical problem solver. Or maybe you have a tremendous talent for building relationships, while your fellow top performer is a brilliant strategist. What’s most important is that you win business your way. Strengths Based Selling explains sales talent and how to identify and maximize it. You’ll receive a code to take the world-renowned Clifton StrengthsFinder assessment, which reveals your unique talents and strengths. Armed with this information, you’ll follow this book through the entire selling process — from assessing opportunity and cold calling to retaining and growing accounts — learning how to apply your talents at each step. The book also features action items that will help you make the most of your strengths in sales. There’s no one right way to sell. Salespeople get the best results by building on who they already are. This lively and liberating book will teach you to do just that. Brian Brim, Ed.D., is a Principal for Gallup. For more than 20 years, Brim has worked as a consultant and advisor to some of the world’s leading organizations. His insights have supported many organizations to increase performance by maximizing their talent and human capital systems. Brim received his bachelor’s degree in speech communication and his master’s degree in educational psychology from the University of Nebraska-Lincoln. He received his doctorate in organizational leadership from Nova Southeastern University in Florida.